The Denver Nuggets are one of many teams to be plagued by untimely injuries to key players in this 2017-18 NBA season. They’ve been stretched thin at various positions and found themselves in desperate need of someone who is willing and able to fill multiple roles for a depleted roster. As the Nuggets fight for their playoff lives, it’s hard to imagine where they’d be in this race without Will ‘The Thrill’ Barton. 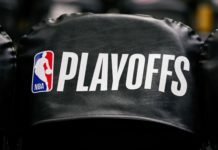 Denver’s sixth man — if you can call him that — has plugged multiple leaks in the proverbial dam that’s separated the Nuggets from playoff elimination. Without him, this thing might have burst by now. 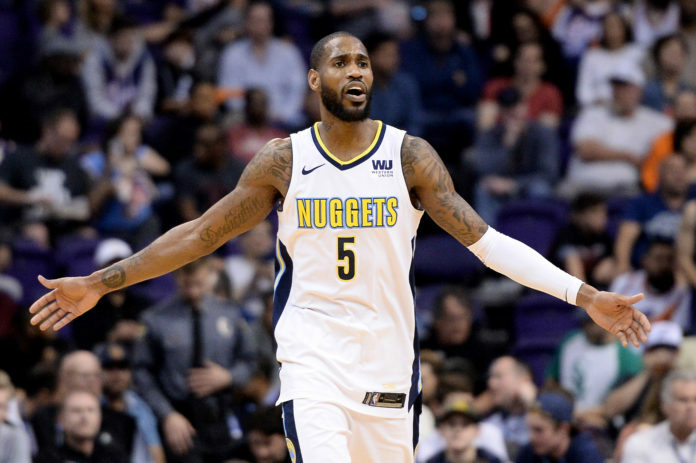 Barton is Denver’s secret weapon, one of the league’s most underappreciated polymorphs and has quietly built a strong case for himself as the NBA’s ‘Sixth Man of the Year’. The Baltimore native has come off the bench at multiple positions, providing some much needed punch for a bench that lacks firepower. 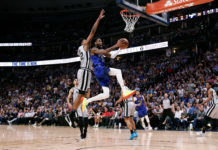 He’s served as Head Coach Michael Malone’s swiss army knife, appearing at both the shooting guard position as well as small forward, and he took on the role of back up ball handler for much of the season as Emmanuel Mudiay slid out of the rotation. As the starting lineup endured injuries at various positions, Barton stepped up and filled the gaps. Wherever he’s been needed, he’s answered the call. ‘The People’s Champ’ started in 39 games this year, which may turn some folks off from considering him a sixth man at all. 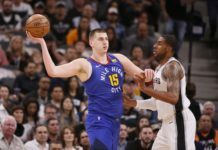 Perhaps that very dynamic is what has prevented an appropriate amount of recognition for his strong season from spreading outside of the local market — or perhaps it’s just that people don’t watch the Nuggets. The fact remains, however, that Barton is indeed still eligible for this award. Eligibility is contingent upon a player having come off the bench for the majority of games that they’ve appeared in, and Barton qualifies — albeit just barely. It would be a reach to consider Barton the favorite, or even the most deserving candidate for this award but he deserves votes for what he’s done to keep the Nuggets afloat. Barton averages a taxing 33 minutes per game this season and he’s one of just two players who have started in less than 40 games while averaging 15 or more points, five or more total rebounds and four or more assists per contest. The other player in that group is Memphis’ Tyreke Evans who was having a career year for the disappointing Grizzlies, although it looks like he will finish with just 52 games played this season after stepping away from the team for personal reasons. The top two vote getters in this category are going to be Lou Williams and Eric Gordon in some order — and that will be well deserved — but Barton has played himself into the conversation for that third slot. ‘The Thrill’s’ game is not without its flaws. The swagger that virtually drips off of him both on and off the court is a double-edged sword, each side particularly sharp and dangerous. For all of Barton’s passing ability, he can develop tunnel vision in crucial moments. He’s known for driving into the teeth of the defense on a fast break, his heart set on scoring, and his eyes fixated on the basket with absolutely no intention of dishing the rock. That’s the kind of Mamba Mentality that you’d expect from a guy who watches Kobe highlights in his down time, but his inability to find teammates on the run, or get the ball to Denver’s best player, Nikola Jokic, has hurt them late in games. Ultimately though, the good has far outweighed the bad for Denver in the final year of Barton’s contract. Those flaws are symptomatic of a willingness to lead by example and step up confidently with everything on the line. For all of the frustration some of his tendencies have created, he’s compiled a large collection of big time performances and a small collection of game saving plays. Barton won’t win this award, but he deserves some recognition for what he’s accomplished this season. There are very few players who can match his level of production off the bench and even fewer who have been asked to do as much as he has. He’s kept his team in the hunt and he has a chance to help push them into the postseason with one more stellar performance in Minnesota on Wednesday.